Las mermeladas caseras son más interesantes, porque añades el dulzor con lo que más interese. 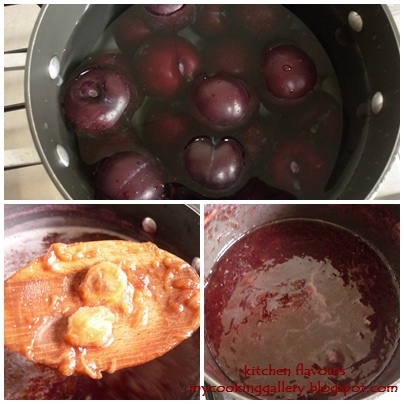 Omg, I love plum jam and it's not easy to find here, so now I can make my own! Thanks for the great recipe, it looks fab! Such a tasty looking jam! I love plums but hardly ever get them. After seeing this I think its time to buy myself a treat :) Thanks for sharing! I love plum jam, delicious. This looks beautiful. Have a nice weeekend. Kisses. You are im my list of favorite blogs. Bye. This looks delicious! You have some lucky family. Plums remind me of my childhood, my mom always kept them in the fridge when in season. I love plums especially in this season! Hello Joy! I read this post while at work on my lunch break, but my computer is so slow that I don't comment while at work. Then promptly forgot until today (so sorry, this is too delicious to forget!). Your jam is beautiful. Plum is my favorite, I cannot wait to forage more plums from the kids trees in their yard. The last time I made plum jam it was gone lickity split. Wow,awesome clicks.It looks delicious and yummy..thanks for sharing this recipe. this looks truly good but phew! that's a long cooking process! any for sale? Love plums and using them in jam sounds terrific! Que precioso colorido me encantan las ciruelas, tu mermeldada se ve estupenda bien elaborada,cariños y abrazos. They look beautiful and I bet they are delicious! Thanks for the recipe! Oh yum, a while back, when I was camping for 4 months, I made some cherry and figs jam and lasted at least for 1-2 weeks. Plum jam is one kind I haven't made yet! Delicious! oohh laa laa..i clicked on yr advert 2x..let's see what happens ya. oh this looks great! i was just at your other blog and now i came here! i don't want to repeat myself but i think i should! i would love if you came over to my blog hop and shared one of your great recipes! you have a great blog!! Homemade jam is terrific! Your plum jam looks amazing. Beautiful. You're making me crave all those delicious autumn fruits now! I love homemade preserves n this looks so nice, thick n delicious- loved the color too..
That tangy jam looks amazing! I hope that I can try to make this when plums are in season here. I'd love to feature your jam on my These Chicks Cooked spotlight Wednesday if that is ok. The plum jam looks fantastic! Love the color too! Ooh, I've never made plum jam before but it makes such a change from strawberry - I bet the flavours taste delicious! I was telling my husband that I should start making my own jams and here is your recipe to get me started. Thanks. I love your blog. I could stay here, for the day. I am not the biggest jam person...except when it comes to plum :) I wish I had some now!